Hello everyone, this month I don’t actually have many favourites as I haven’t really been shopping for anything ‘beauty’ related, bad I know. Anyway I have found some new products, and brought out some older ones. 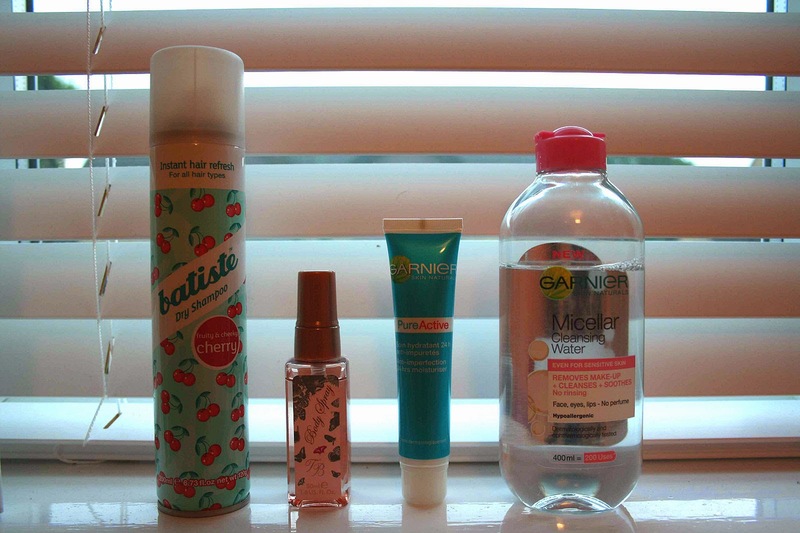 So firstly, Batiste Dry Shampoo in cherry, I have had this for quite a while now, but recently been using it again. I have started washing my hair every other day, depending, and this dry shampoo really just gets me through and keeps my hair feeling soft and not greasy. Secondly the Ted Baker Butterfly Wings Body Spray, I have three of these sprays because they smell so damn good. Perfume is so expensive, whereas body sprays not so much, and this acts probably just as well as a perfume. The smell is lovely and you can smell it pretty much all day, which is super good and it’s not expensive at all! Now the next one has just been my savior this month! The Garnier Skin Naturals Pure Anti-Blemish Moisturiser. For starts, the smell of this is so fresh, it isn’t oily whats so ever, but kind of watery. It feels so good on your skin, really refreshing. It’s perfect for any dry skin, and fixes that within a few uses. Also keeps blemishes and spots away, it really says what it does, I would recommend this to anyone! Finally, everyone has probably heard of this and seen about a million posts about it but I jumped on the bandwagon and bought this and it truly is amazing and super refreshing on your skin. The best cleanser I’ve ever used by far and so much better than using make up wipes! Thanks for reading, I hope you enjoyed reading and finding out what my favourites have been this month! Comment what you’ve been loving and any suggestions on things!